Out of the infamy of 9/11 and its aftermath people rose up with courage and determination to meet formidable challenges. On the Ground After September 11: Mental Health Responses and Practical Lessons Gained is a stirring compilation of over a hundred personal and professional first-hand accounts of the entire experience, from the moment the first plane slammed into the North Tower of the World Trade Center, to the months mental health professionals worked to ease the pain and trauma of others even while they themselves were traumatized. This remarkable chronicle reveals the breadth and depth of human need and courage along with the practical organizational considerations encountered in the responses to terrorist attacks. The goal of any terrorist act is to instill psychosocial damage to a society to effect change. On the Ground After September 11 provides deep insight into the damage the attack had on our own society, the failures and victories within our response systems, and the path of healing that mental health workers need to travel to be of service to their clients. Personal accounts written by the professionals and public figures involved reveal the broad range of responses to this traumatic event and illuminate how mental health services can most effectively be delivered. Through the benefit of hindsight, recommendations are described for ways to better finance assistance, adapt the training of mental health professionals, and modify organizations’ response to the needs of victims in this type of event. Reading these unique personal accounts of that day and the difficult days that followed provides a thoughtful, moving, rational view of what is truly needed in times of disaster. 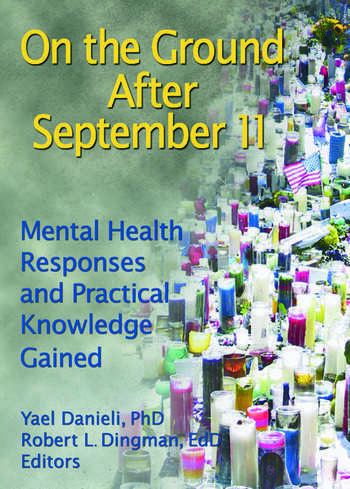 The Coalition of Voluntary Mental Health Agencies, Inc.
On the Ground After September 11: Mental Health Responses and Practical Lessons Gained poignantly illustrates that regardless of profession, culture, religion, or age, every life touched by 9/11 will never be the same. This is essential reading for counselors, psychologists, psychiatrists, social workers, therapists, trauma specialists, educators, and students.